Standards are 24-1/2"H x L for desk height and 27-3/4"H x L for bench height. Panels are reinforced, and incorporate a wire trough for cord and wire management. 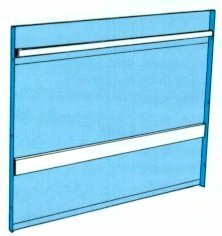 These panels mount between cabinets and/or legs and to the bottom of the work surface. They provide privacy and create a neater work environment. They can also add stability to a workbench. Designate desk or bench height by adding suffix DH or BH respectively.